Electrospinning is a fibre forming process, which utilizes a high voltage electric field to produce an electrically charged jet of polymer fluid. An electrode charges the polymer fluid droplet; which ejects into a fine fluid jet when the repulsive forces induced by the electrostatic charge overcome the cohesive forces of surface tension and viscoelastisity of the polymer fluid. The jet splits and elongates as it accelerates under the electric field. The solvent from the fine jets evaporate rapidly due to its large surface area and it solidifies and produces a nanofibers which is deposited in a form of a web on the oppositely charged collecting counter electrode placed at a distance. Why is the process of electrospinning important? Electrospinning is carried out in laboratory by applying a high voltage to a polymer droplet suspended at the edge of a needle. The polymer droplet is fed with a polymer solution at a low flow rate. The voltage supplied must be high enough to create a Taylor cone and eject a fine jet of polymer from the droplet. The jet is collected on a grounded collector placed at a distance. The solvent is evaporated during its travel path from the needle to the collector. A deposition of nanofibers can be collected from the collector. To study the effect of different parameters like polymer, solvent, ambient parameters, voltage etc on nanofiber morphology. To control the ultimate nanofiber properties for organic polymeric fibers as well as inorganic nanofibers. Using there nanofibers for different application like tissue engineering, filtration, composits, electrical conducter etc. We have been successful in producing nanofibers from a variety of polymeric and inorganic materials. 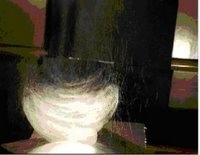 Formation of bead free nanofibers especially when spinning fibres of diameter less than 100. Stabilization of process parameters for different polymeric as well as inorganic nanofiber for reproducible results. specially for inorganic nanofiber where calcination temperature has been found to have high importance. Overcoming problems of nonuniform web formation on applying multi syringe and needle-less systems. To produce defect free nano fibre webs consistently for continuous production. Effect of parameters on nanofibre properties for several polymeric nanofibers like PCL, PVA, PAN, Gelatin, PVAc etc as well as some inorganic nanofiber like Zinc Oxide (ZnO), Ferric Oxide (Fe2O3) and Alumina (Al2O3) have been studied and established. Apart from conventional mats, electrospun materials in the form of self assembled yarns and bulky non-woven structures have been produced. Uniform deposition of nanofibers in a continuous manner. Patented (patent pending) technology for continuously producing nanofibre webs at production rate of about 0.1-0.5 GSM at a collector speed of up to 3 m/min. ZnO rods with high aspect ratio were synthesized using hydrothermal non- stirred vessel. Composite nanofibers reinforced with ZnO rods were obtained using electrospinning in different polymer systems. Both random and aligned nanofiber webs were electrospun. ZnO rods were found to be aligned along the nanofiber axis. Concept of minimum electrospinning voltage (MEV) in electrospinning of PAN–DMF system: effect of distance. In this study, the effect of needle to collector distance on MEV (Minimum electrospinning voltage) and nanofiber morphology was investigated. The diameter of the nanofibers was found to be primarily dependent on the dope properties and independent of electrospinning process parameters. However, the slope of the plot between (MEV)2 and surface formation rate was found to increase with increasing needle to collector distance signifying that the resistance in electrospinning increases linearly with the distance. Figure 4. 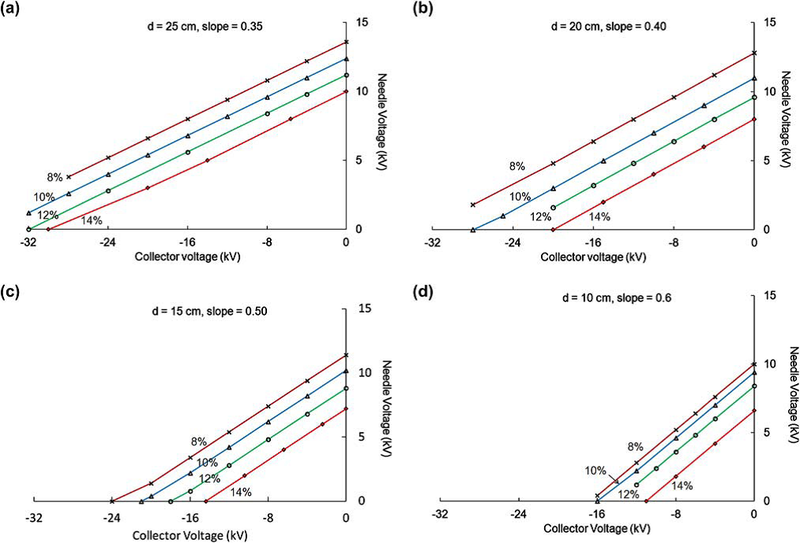 Dependence of needle and collector voltage for 8, 10, 12, and 14% PAN concentration and 0.2 ml/h flow rate at needle to collector distance of (a) 25 cm, (b) 20 cm, (c) 15 cm, and (d) 10 cm. The diameter of the nanofiber and area of deposition are the two most important properties that define the morphology of nanofiber webs. The area of deposition of the nanofiber web was found to be dependent on the process parameters such as needle to collector distance, collector voltage, and flow rate as well. Figure . 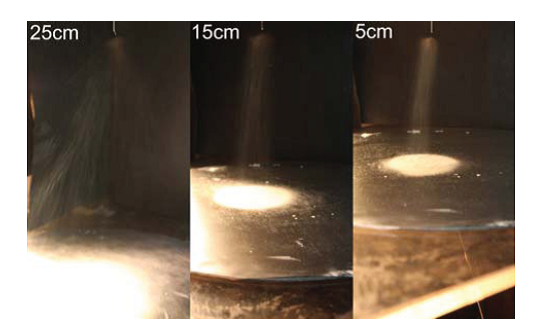 Photographs of electro spinning jets 14% PAN at 1 ml/h flow rate, at needle to collector distance of 25, 15 and 5 cm (showing reduced area of deposition with decreasing distance). A series of poly(acrylonitrile-co-methylacrylate) copolymers (PAN) with varying molecular weight were synthesized by radical copolymerization using α-α'-azobisisobutyronitrile (AIBN) as initiator. These copolymers were dissolved at different concentrations in DMF and electrospun at Minimum electrospinning voltage (MEV) to correlate electrical energy required to perform the mechanical work during the spinning of the fibers. The diameters of the resultant fibers were correlated with the Berry number and average number of entanglements per chain of the spinning solution. Figure. SEM images of electrospun nanofibers of PAN2X at varying concentrations (5 to 10 wt %). Polyacrylonitrile solutions in N,N-dimethylformamide (DMF) were electrospun into nanofibers by charging the polymer fluid in an electric field. 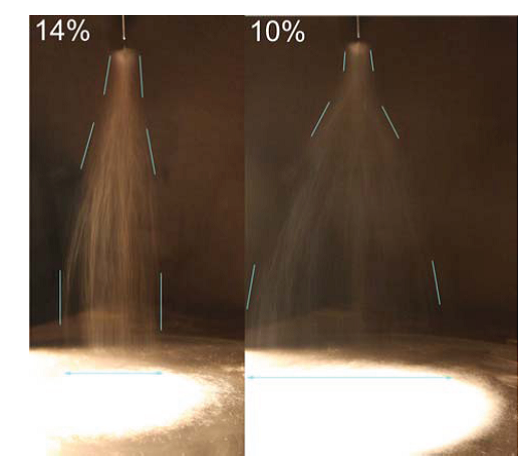 Controlled experiments were performed using a needle type spinneret to investigate the effect of various electrospinning parameters on the percentage conversion of polymeric fluid into fibers and on fiber diameter obtained. It was found that when the polymeric fluid was continuously fed at a constant rate, application of a minimum electrospinning voltage(MEV) was necessary to ‘‘completely’’ convert the ejected fluid into nanojets to form nanofibers. Also, that the maximum amount of splitting or elongation that a polymeric fluid could undergo was primarily dependent on number of entanglements per chain in the fluid. 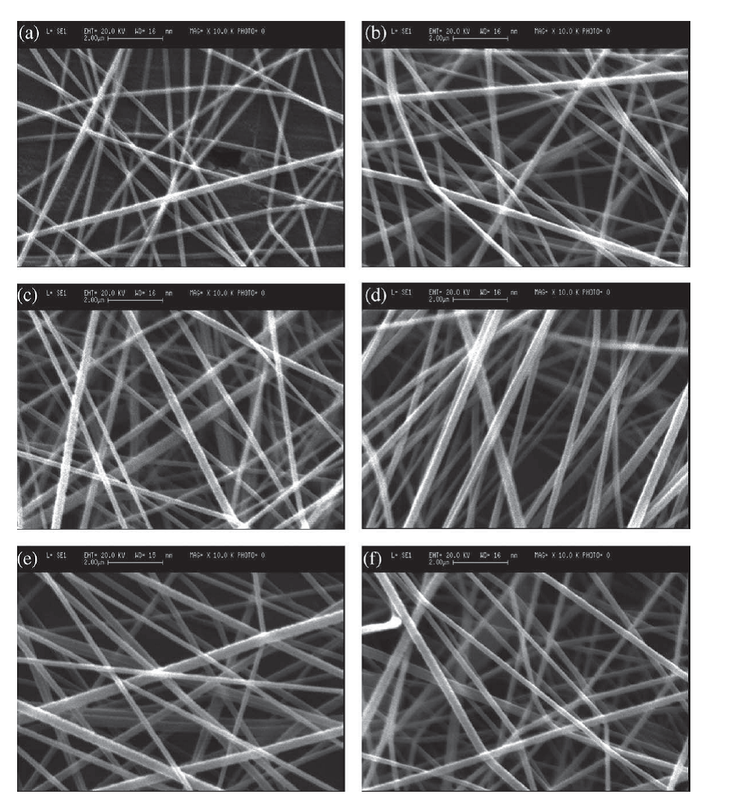 Figure : Micrographs of nanowebs obtained by electrospinning 12 wt % PAN in DMF at needle voltage of (a) 5kV, (b)10 kV, (c) 15 kV, (d) 20 kV, (e) 25 kV, and (f) 30 kV.